When it comes to science and mathematics, many studies show students in the United States are falling behind when compared to students in other countries. Experts claim by the time they reach the high school level, students just aren’t interested in science and math or find the subjects boring in the way they are taught. University of Minnesota College of Science and Engineering students are doing their part to help with the problem. They’re boosting middle schoolers’ interest in the science, technology, engineering, and mathematics (STEM) subjects with an event called CSE Expo that they organized for the first time this past spring. Described as a showcase of engineering creativity, CSE Expo was the brainchild of CSE students Ben Ihde, a physics and astrophysics major, and Jack Kilian, an electrical engineering major, who met as members of CSE’s Tesla Works student group. The wheels for the event started turning in January 2013, after Paul Strykowski, CSE associate dean for undergraduate programs, announced that CSE donors Nancy and Clifford Anderson would make grant money available for the right project. Their intent was twofold—get as many CSE students involved as possible and create an event that would impact the Minneapolis/St. Paul community. Imagining the possibilities, Ihde and Kilian set out to win the grant through an application and ultimately secured the $200,000 award. They fine-tuned their idea to focus on middle school students. According to Susan Kubitschek, CSE assistant dean of student programs, outreach events like these help to show a broad range of science and engineering professions to students who may not have had much exposure to the STEM fields. “We knew all middle school students wouldn’t respond to the same things, so we wanted to showcase different areas of science in order to change the limited perception some students may have of it,” said Ihde. The project really began to take shape once Mia Bronstein, a statistics major, was brought on board. “She had done a similar event in high school for elementary schools so her experience was extremely valuable in figuring out logistics,” Kilian said. By November 2013, the trio had recruited four additional students. As the event’s management team, they outlined their goals and objectives and structured the tasks that needed to be done. Six months later, more than 2,000 Minneapolis/St. Paul middle school students experienced the first CSE Expo. Held on the University’s East Bank Campus—Northrop Plaza and Church Street—the outdoor, open-house-style event featured 55 distinct hands-on projects, demonstrations, and shows, including flying robots and hovercrafts, rockets, and the Strandbeest, an 11-foot-tall pedal-powered walking machine. For all the hours spent—balancing academics and managing the CSE Expo—Ihde, Kilian, and Bronstein believe they pulled off an extremely successful event worthy of all the effort. Plans for next year’s CSE Expo begin this fall with Ihde, Kilian, and Bronstein taking the lead once again. They intend to invite about the same number of middle school students. CSE Expo’s ultimate goal is to spread the good word about science and engineering far and wide, and to inspire the next generation of scientists and engineers. 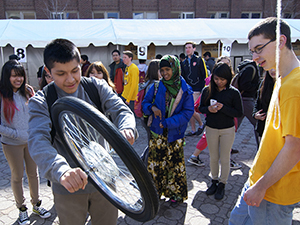 Many CSE student groups inspire young students in the STEM fields year-round. On the next pages, two CSE student groups show how they share their love of science and engineering with young students.